Recently I had a reporter talk to me about my web site and little robot car video. There were a lot of quesitons and I had to kind of give up my life story. So finally the article came out and I am told it is quite complimentary. I don’t read Chinese much, so I trust that is was a good article. When I was talking to the reporter I tried to promote my video, “Robocars of China“. Apparently this is highly specialized interest film. That is filmspeak for boring. It seems like everybody I talk to says that they have seen part of it. So if you weren’t already interested in high tech startups, the Guiyang Big Data project, driverless cars (cars that drive themselves), or learning technology English, you might not be interested in this video. Even more disappointing than months of work maybe down the drain, people don’t seem to even like my handwriting with the Chinese lettering brush (maobi). They say the music and handwriting is kind of a waste of time. Well, enough about the video, I was happy to be interviewed by the Guizhou Evening Newspaper. foreigners wrote thousands of “love letters”! When Guiyang meets Michigan, what sparks will it shine? In recent years, with the development of social economy, Guizhou’s beautiful landscapes and humanities have frequently entered the international arena. American Jack walked Guizhou for 20 years, built websites, wrote articles, made videos… with more than 1,000 special “love letters”, “confession” Guizhou, also promoted Guizhou to the world. “I came to Guiyang in 2000. I didn’t want to leave when I came.” The 68-year-old Jack came from Michigan, USA. In 2000, Jack came to Guizhou Normal University as an English teacher as a volunteer, and spent his free time with his friends. Jack said that Guiyang is beautiful and mysterious, and it immediately attracted him. Before coming to Guizhou, Jack thought that the place he taught was an occluded place, but he did not expect that Guizhou was so beautiful, everywhere was beautiful, people lived slowly. He said that he likes to see Guiyang people rolling their trousers and rolling their sleeves to eat barbecue. After eating, they pick up their clothes and pat their stomachs. This is completely different from the rhythm of life in the United States. ▲ Jack gave himself the Chinese name, on the left is the handwriting of Jack’s friend, and on the right is Jack’s own handwriting. In the past 20 years in Guizhou, Jack can be regarded as an “old Guiyang person”. He likes to eat Bean Rice Hot Pot, Huaxi Beef Powder, Intestines, and the degree of spicy eating can already beat many foreigners. Except for the spicy chickens, the others are not in the air. He also likes to take the bus. He said that different people can be observed on the bus. On one occasion, Jack waited for the bus in Taiyingpo. As a result, there was a bird on the tree. The bird pulled a sputum and put it on his suit. Jack was very excited. “That is the biggest and darkest bird dropping I have ever seen.” . Jack said that he later got on the bus, someone gave him a tissue, and someone gave him money to buy clothes. He thought it was very interesting and very moving. Jack said that Guizhou is not only attracted to the human landscape, but also fascinated by the development of science and technology. “Guiyang’s university is developing and Guizhou’s development is also very fast”. 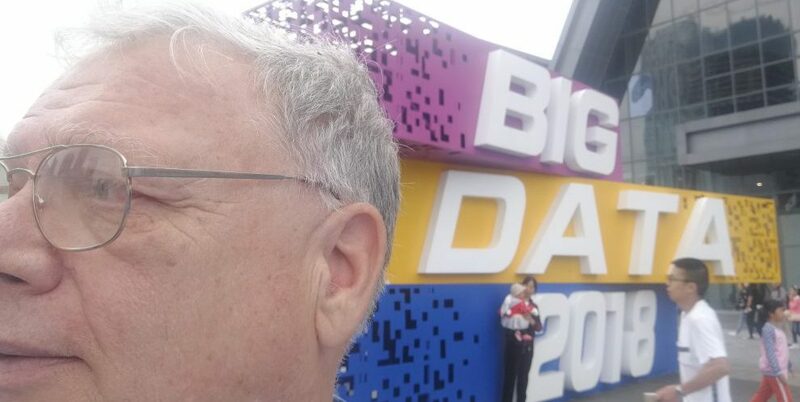 Jack saw the establishment of Guiyang North Station, Metro Line 1 and Big Data, and witnessed the rise of the city. I don’t know how much to witness in Guiyang in the future. miracle. Before leaving the United States, Jack was the chairman of the US Sea Transportation Authority, so he was particularly interested in Guizhou’s big data and traffic. Jack himself is also a computer programmer. In 2012, Jack created his own foreign language website – visiting Guizhou, his website. (Note on translation: Besides the obvious differences in language and machine translation, I have one correction: I was Chairman of the Bay Area Transportation Authority (BATA) of Traverse City, Michigan, USA. The techy RoboCars of China video was invited to the Science Council of New York City Annual Meeting, but we coudln’t go. Instead we sent our business cards, specially designed for the Annual Meeting event coming this April 6. 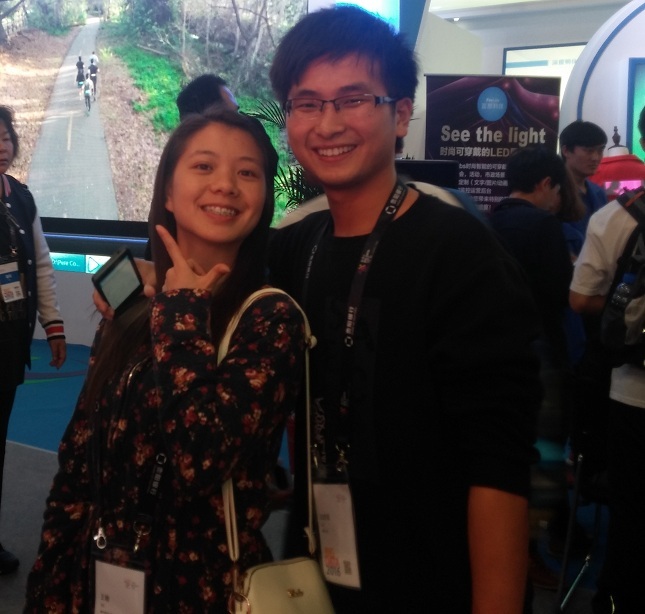 It is particularly exciting for fans of Guiyang because there are potentially thousands of New York City young people that can be exposed to the technology of China’s Big Data Valley as featured in the video. Further, through the www.tourguizhou.com website, the full range of the Guizhou portfolio will be featured. For information about the event and the Science Council, visit:SCoNYC . A consolidated listing of the Pixmoving offerings of 2018 is listed at Future of AV Open Source See the movie about Pixmoving at: Robo Cars of China . The Autonomous Vehicle (“AV” or Automated Vehicle) technology is the next big thing in technology. The Big Data Valley initiative of Guiyang can jump start the creation and nurturing of a technology Village (Guiyang Tech Village) in Guiyang. The Big Data initiative has already started this process, but there is still a need for focus of the resources being created by the the Big Data initiative. AV technology requires a combination of two of the “Big Three” technology initiatives in the world, Artificial Intelligence (AI) and Robotics (Biotech is the third). China and the USA are similar in that about 2/3 of GDP is consumer driven. Housing is the #1 consumer purchase, and cars are #2. The market for auto enhancements, such as AV, is massive. These concepts are developed elsewhere on this site, but the implementation of AI and Robotics in Guiyang can use the AV technology framework. Sensors, machine learning, actuators, and decision making are all required when a car, truck, or bus is driven by a human. The AV research, the testing, and application of that research provides a concrete focus for so many of these advanced research subjects. An AV initiative in Guiyang has the potential of attracting top talent to Guiyang companies and universities. Technology people can usually choose where they want to live, but the technology village concept multiplies the productivity of individuals. Guiyang already has the quality of life that is attractive to the young techies. See: Guiyang Top City The AV provides a focus for those techies. Automate bus maneuvering and parking in the North Guiyang Train Station (Beizhan Gaotia). Retrofit existing BRT buses with sensors, actuators, and computers with cloud communication. Connect the BRT buses to the Guiyang Big Data infrastructure and then begin building and learning. Retain existing bus drivers to monitor effectiveness of the developing technologies and provide tertiary manual override in event of technology failures of primary and secondary automation. Also, presence of drivers on the buses is important for customers to feel safe. Initially it is essential to get “cheaters” under control in the dedicated BRT lane of the #2 Ring Road. Connect the BRT cameras to software that can identify people who break the rules against using the dedicated BRT bus lane for cars. Progressively heavy fines should be used to keep private drivers clear of the bus lane. Fine revenue can also be used to help finance AV research. When the “bugs” are out of the BRT automated vehicle control system, wealthy drivers should be permitted to retrofit their vehicles with AV equipment. This will allow them to return to the dedicated bus lane for high speed travel around Guiyang, taking advantage of both the dedicated bus lane and the Big Data controlled transport system. While Guiyang is one of the most densely populated cities in the world, with five million people stacked together on the plateau, wealthy drivers could take advantage of early AV technology to maneuver the city. After using AV on the BRT dedicated lane, they can gradually expand their range of operation to go to and from common destinations, like home and work, etc. As prices of AV equipment fall, more and more Guiyang people will be able to afford to enter the automated vehicle system as it gradually expands from the #2 Ring Road into the general streets and alleys of Guiyang. Companies that cooperate with Guiyang early in development of AV technology will be leaders in the AV industry as it expands. Guiyang will grow a world class technology community, the Guiyang Tech Village. The City of Guiyang has, knowingly or not, positioned itself perfectly for entry into the Automated Vehicle market. Through the creation of the BRT (Bus Rapid Transit) system connected to a State of the Art bullet train station, a publicly controlled space which can control all vehicles entering and leaving the system has been created. The train station (Beizhan) is a multimodal transport system with cars, buses, bullet trains, and even express busses to the airport. The BRT utilizes a dedicated bus lane which is one of three traffic lanes on the Number 2 Ring Road (#2RR) which circles Guiyang through proximate suburban developments. While operating at a relatively slow speed, the BRT has reduced cross-town transit times by approximately two thirds or more, depending on traffic. There are no stop lights on the #2RR and the dedicated lane greatly reduces the traffic jams to which buses are subjected along with private vehicles. The system operates with a high degree of efficiency despite “cheaters” who are drivers that are willing to accept a large number of traffic tickets for using the bus lane for their private vehicles. AV market has exploded in western countries, particularly Europe and the USA, with increasing interest from China and the East. With all the money and interest, widespread use of AV has been stymied to a degree by the insecurity of the public to share the road with driverless cars. While technical issues remain, the biggest obstacle to AV isn’t technical, but rather political and social. Governments are simply not willing to subject their constituencies to the perceived risk of driverless cars. Computer controlled vehicles sharing public roads private vehicles (with occasionally irrational or careless drivers) is deemed unacceptable to all parties. Nevertheless, Elon Musk, of Tesla and SpaceX fame has suggested that the safety record of computer controlled cars will display about 10 percent of the accidents of human controlled. Tesla claims that a driverless care will travel from California to New York within the year (2017). 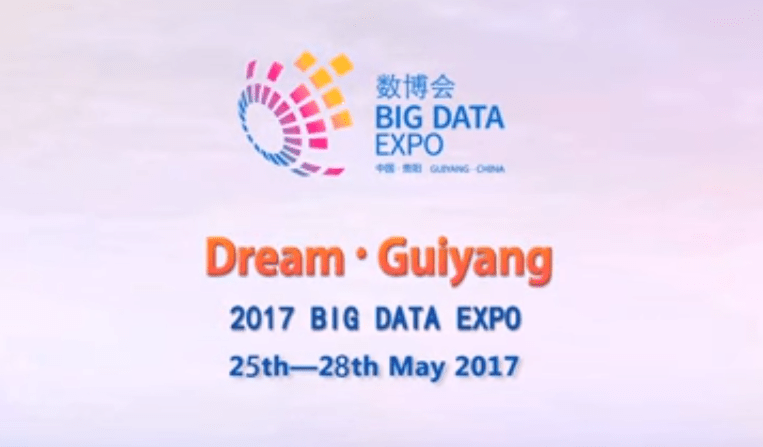 Even more interesting, the Guiyang Big Data Expo is May 25 to May 28. Big Data is the next big thing in computer technology. The auto industry represents the second biggest consumer expenditure in the world (housing being the first). The AV technology requires more research and a good location to perfect this technology. It is a data intensive application in the world’s second biggest consumer industry. 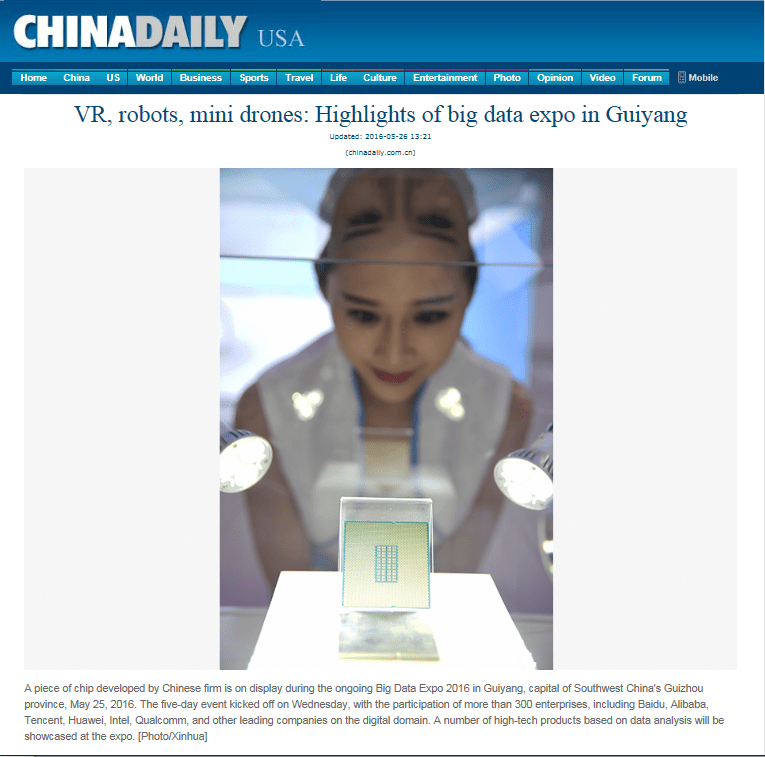 This Big Data Conference could be a “breakout” for Guiyang and the AV Industry. The Beizhan “multimodal” Train Station has a controlled bus maneuvering area connected to a controlled ring road around Guiyang. It is an ideal physical and political environment for development of Automated Vehicles, one of the biggest Big Data applications on the horizon. This will be an interesting conference. My students Wang Min and Bai Zhong Jun attended the conference and helped me talk to the exhibitors. Wang Min loved to play with the Virtual Reality Three Dimensional Glasses. When you view the world through these glasses, it takes you to a differenct world and a different reality. When you turn your body around, you are looking at a different world behind you, but in fact you are standing in the middle of a conference. Wang Min loves this new toy.